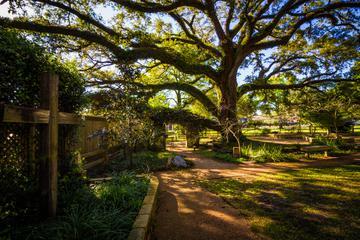 Underneath the lengthy branches of a century-old live oak tree rests the First Baptist Church Prayer Garden. The garden is a place for you to do special and sensitive work...the work of prayer. At every stop in the garden, visitors can experience a time of quiet meditation and personal concentration. Paths in the garden lead the visitor along a rock-lined brook, through a gracious archway, and into an introspective labyrinth. At various seasons of the year, the garden is alive with colorful flowers and unique vines, shrubs, and trees. Three wooden benches offer visitors a place to rest. Nearby, a copper wind sculpture comes to life at the slightest breeze reminding us of the Holy Spirit - moving, coming & going, and alive in the world. Prominent in the garden is a tall, wooden cross - a focal point for a walk in the garden. The lighted prayer garden seems to call people in during the daytime or evening hours...just for a casual walk, a focused time of prayer, or a moment of peaceful reflection. The open fencing is an invitation for visitors to come in and experience the garden. The area is wheelchair accessible, and all walkways lead to the cross. 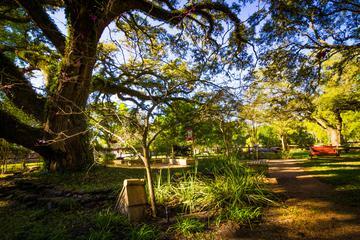 The garden is located a few blocks from the Fort Bend County Courthouse, between Fifth and Sixth Streets in Richmond, just behind the church. 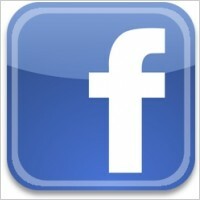 You are encouraged to enjoy and use this space. 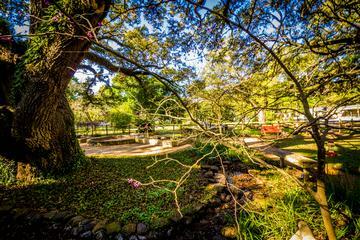 If you are interested in reserving the prayer garden for group use, please call the church at 281-342-8664.